Posted on October 16, 2013, in Diabetes, Wordless Wednesday and tagged nutrition facts, product labeling. Bookmark the permalink. 10 Comments. Ugh I’ve always hated that about popcorn labels. And precisely who are these people eating all of this unpopped popcorn anyway? While I don’t understand why you would need the carbs for unpopped pop-corn, I do understand this logic. Similar to how things work with pasta that is cooked al-dente verses fully cooked, the longer the cooking time the higher the carbohydrates because of how the heat converts parts of the food that wouldn’t normally be used as carbohydrates into carbohydrates. Weird, I know. But that would mean the “popped” counts should be higher than the “unpopped” ones, right? This shows the reverse. I had no idea about the pasta, by the way. It’s a good thing that I get impatient when making pasta, and usually end up eating it undercooked. Yeah, I saw that and did a double-take. Wierd. Things like this just make me scratch my head and dread the next time I get a piece of popcorn hull stuck in my teeth. 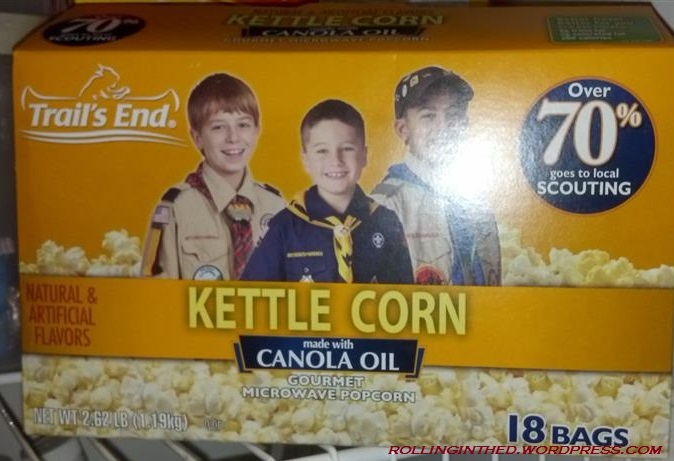 I still don’t understand why they would have any reason to put the carb content of unpopped popcorn…..
Not a clue — maybe there’s some underground cult movement for off-label consumption of unpopped microwave popcorn, just like there’s a contingent who likes to snort aerosol-propelled whipped cream. The manufacturer is required to let you know that you can get high — in more ways than one. The whole nutrition label thing is just messed up. The drop in nutrition is probably an average of wastage from unpopped kernels. However a more complicated issue is that cooking actually modifies many foods, usually making them more digestible and actually changing the nutrition that is actually absorbed. I suspect that many food manufacturers simply choose whether to put raw or cooked on their label based on what makes them look better. Nutrition measurement and labels account for none of the effects of preparation, they are simply a bunch of chemical tests done in the lab, only peripherally related to human digestion. Thanks for keeping a close eye on the popping. ps. I wish the boy scouts and girl scouts would start selling something that is healthier. Thanks for the feedback, Brian. 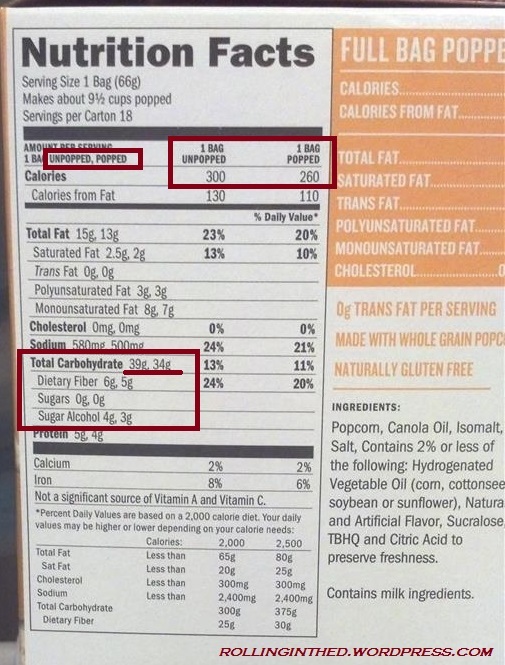 It is true that the methods they use to determine nutritional information is crude at best (I’m sure every kernel of corn is slightly different than the next) and I’ve often wondered how much confidence they have in those numbers. I thought about the possibility of not counting the wasted unpopped kernels, but then, by that logic, the entire “unpopped” column should have been zero, right? Maybe the scouts will one day sell fresh broccoli and carrots after an agricultural expedition, but I think we’re stuck with the junk food — it’s what raises the most money.